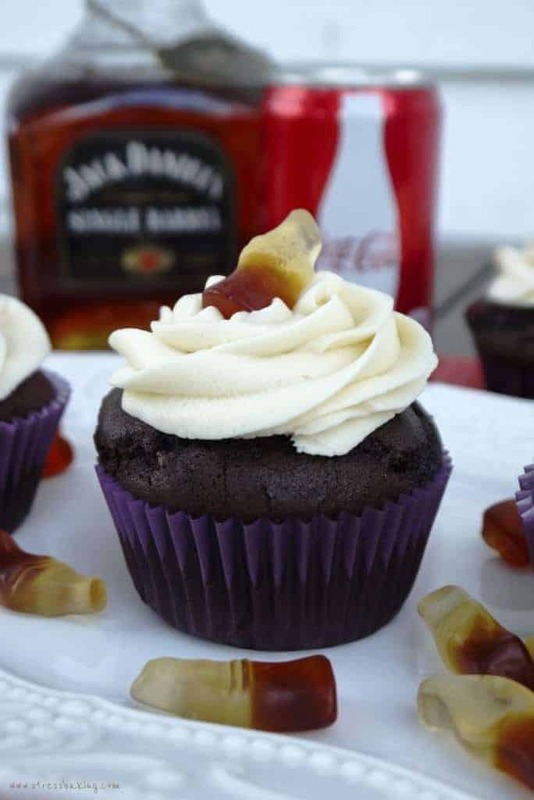 The site’s most popular recipe of all time: Jack and Coke Cupcakes! Rich chocolate cola cupcakes filled with a Jack Daniel’s whiskey chocolate ganache and topped with a creamy whiskey buttercream frosting. My Jack + Coke Cupcake recipe is, hands down, my most popular and most pinned recipe. Despite it’s obvious success, I’ve been wanting to tweak the recipe for a long time. And now only that, but I wanted to get new pictures. This time two years ago (when I originally created that post), I didn’t have a camera and was living in a very dark apartment. It was like living in a cave. All my pictures were taken with my iPhone and under the horribly unnatural glow of the stove light. I liked the cupcake batter I used, but I knew I could make it better. I wanted to create a richer chocolate base that would give me more of a domed, cracked top. I never liked that the original recipe would leave the cupcakes flat on top, even though that just encouraged me to pile on more frosting. Okay, fine – because it would encourage me to pile on more frosting. I wanted to feature the cupcake just as much as the ganache and the frosting. Let’s take a look at the difference between the two, shall we? Not only does my new recipe have the domed, cracked tops that I like, but the color is darker and more rich. The original recipe has more of the “Coca Cola Cake” color and appearance, which isn’t a bad thing – just not what I wanted as the base for the whiskey additions. I mean, really – the difference is night and day. I’m almost embarrassed. My love affair with cracked, puffy cupcake/muffin tops is borderline obsessive. They’re just so pretty. The changes I made aren’t huge, but enough to make a huge difference. Note: They’re still not going to get you drunk – sorry. I decreased the amount of butter and eliminated the sour cream altogether. To make up for those, I tripled the amount of Coke and doubled the amount of egg. I also tweaked the amounts of cocoa powder, flour and upped the amount of baking soda just a smidge. I didn’t change the amount of white sugar, but I did add brown sugar to the mix to make the cupcakes a bit softer. Just inhaled your cupcake (that’s what she said) and it was . . . well, after that first bite it’s all a blur. Seriously, SO delicious and I could eat an entire cake-pan full of that icing. In fact, I’m headed to rehab this afternoon because of it. You’re a baking genius. Thank you so much for honoring me with one of the few your had! . . . . And now, I will attempt to walk a straight line. I didn’t change anything about the ganache or frosting in the recipe itself, but I did play around with dark chocolate chips in the ganache and adding a bit of vanilla extract to the frosting. Both were delicious, but I like the original recipe I had for each so I just added those notes as optional in case you wanted to try something a little different. I’m thrilled with the way the revised version turned out, and I hope you love it as much as I do. Let me know your thoughts in the comments! My most pinned recipe of all time! Rich chocolate cola cupcakes filled with a whiskey chocolate ganache and topped with a creamy whiskey buttercream frosting. Preheat oven to 350 degrees F, and line 24 cupcake cups with aluminum liners (or use silicon cupcake holders). Set aside. In a medium saucepan, combine Coke and butter and bring to a simmer over medium heat. Add cocoa powder, sugar, brown sugar and whisk until sugars are dissolved and mixture is smooth. Set aside to cool for 15 minutes or so. In a large bowl, lightly beat egg. Add cooled cocoa mixture and stir to combine. Add flour mixture and stir until just combined. Pour batter into cupcake liners, filling them 3/4 of the way. Bake for 15-20 minutes, until a toothpick stuck in the center comes out clean. Transfer cupcakes to wire rack to cool completely. Place the chocolate chips in a small heatproof bowl. In a small saucepan, heat the cream until it’s simmering and then pour it over the chocolate in the heatproof bowl. Let it sit for one minute and then stir until smooth. Add the butter and whiskey and stir until combined. Let the ganache cool enough that it won’t give you trouble when you place it in a piping bag. Cut the centers out of the cooled cupcakes – I used a small paring knife, but you could also use an apple corer or a cupcake plunger (if you’re fancy schmancy and have one). Put the ganache into a piping bag with a wide tip and fill the holes in each cupcake to the top. If you’re like me and don’t have a real piping bag, just put it in a plastic freezer bag and cut off a small corner. Whisk the butter in a large bowl with an electric mixer for a couple minutes. You want it to be light and fluffy. Slowly add the powdered sugar, a few tablespoons at a time. Trust me – you don’t want to pour it all in at once. For one, you’ll make a gigantic mess because the sugar will explode all over your kitchen and make it appear as though a blizzard blasted through your window. Also, the frosting will be grainy and impossible to mix properly. Once you’ve used about half your powdered sugar, add in a bit of whiskey and then mix again. This will thin it out a bit, allowing you to continue mixing in the remaining sugar. Continue to add a bit of whiskey and mix until you’ve used all the sugar. As far as I’m concerned, using more than 3 tablespoons whiskey is NOT a problem. I accidentally dropped 5 tablespoons in the bowl… and a few tablespoons in my mouth… oops. You can also add a teaspoon of vanilla extract if you want it to be less whiskey-y. Pipe the frosting onto the cupcakes however you’d like. Top them with the little gummy cola bottles and voila – adorable, deliciously whiskey infused cupcakes! Keep in mind that elevation can affect your results, as well as the temperature of your ingredients. I’m sorry, I don’t understand your question. Can you try rephrasing so I can help? hi! I was wondering where you are – I’m in the UK and my cooker doesn’t go up to 350 degrees, trying to work out how to adjust but I thought if it wasn’t like our cooker’s it would be 350F? I thought it was just degrees and F for cooking everywhere. mine is also fan assisted if that makes any difference :/? I’m in the US, but I’m sorry, I don’t really understand your question. The temperature is listed as 350 degrees F, so I’m not sure what the conversion would be for you on your own oven. However, I believe that translates to 176 degrees C, if that helps at all.